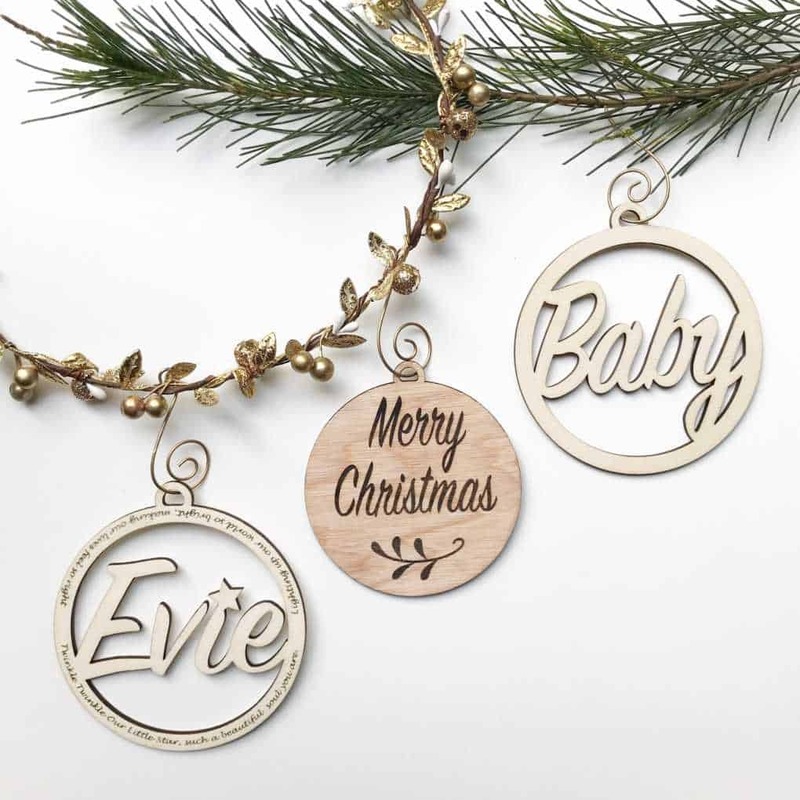 Please tell us the name and font style (script or classic) you would like for your drop. If you would like it left plain please state this. Please state the alphabet letter you would like if you have chosen this option. 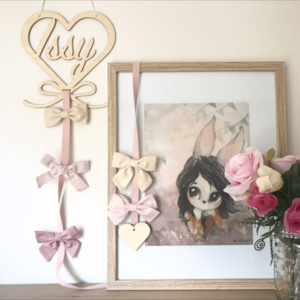 Are you looking for beautiful nursery decor and children’s room decor? 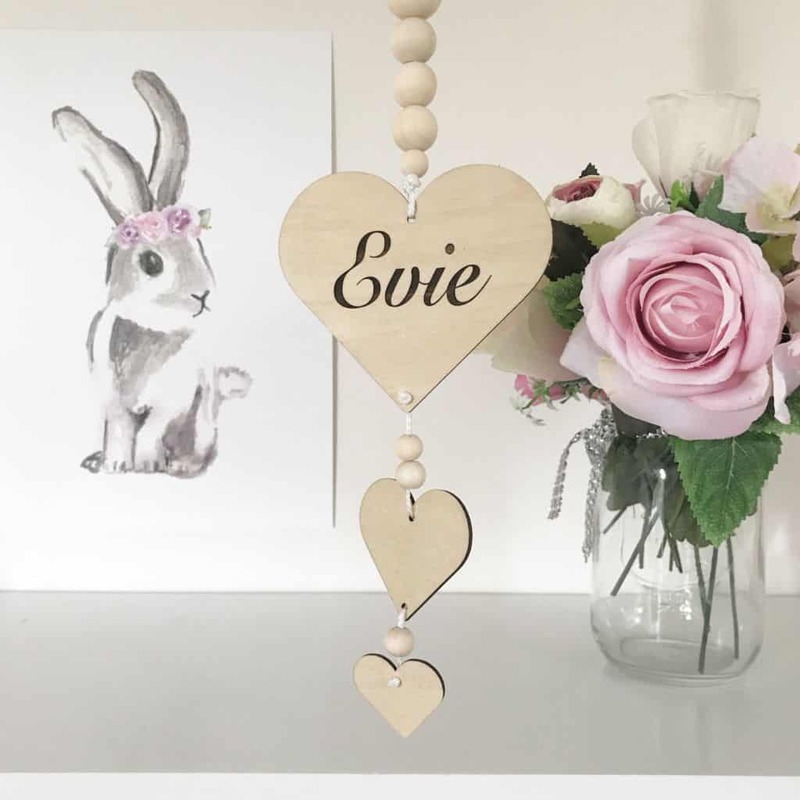 Our beautiful and unique Personalised Name drops and garlands will add such a sweet touch to your little boy’s or little girls’ room. 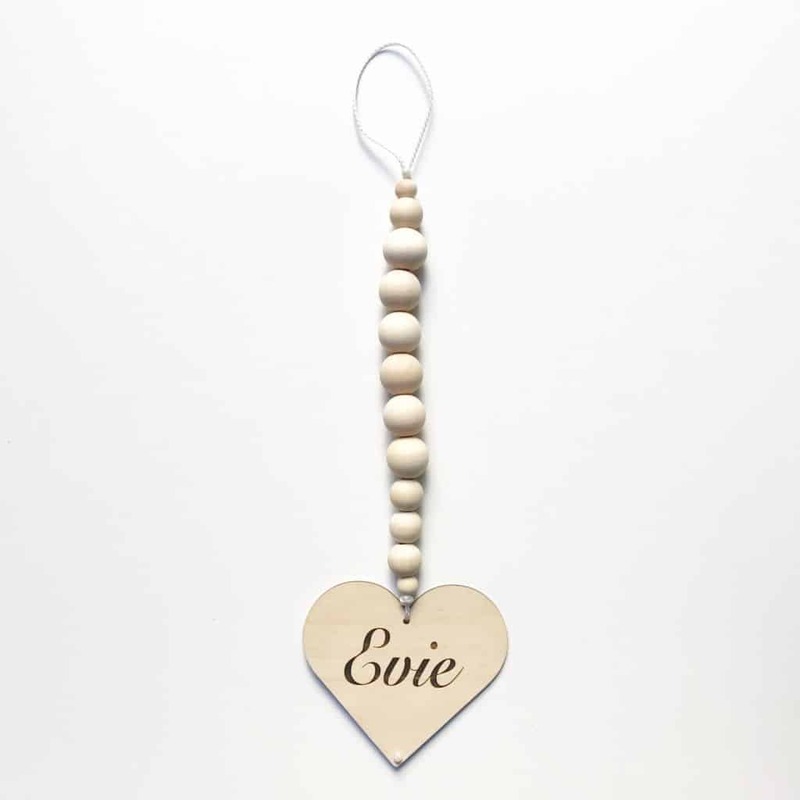 There are so many gorgeous designs to choose from and they can be left plain or personalised with a name. 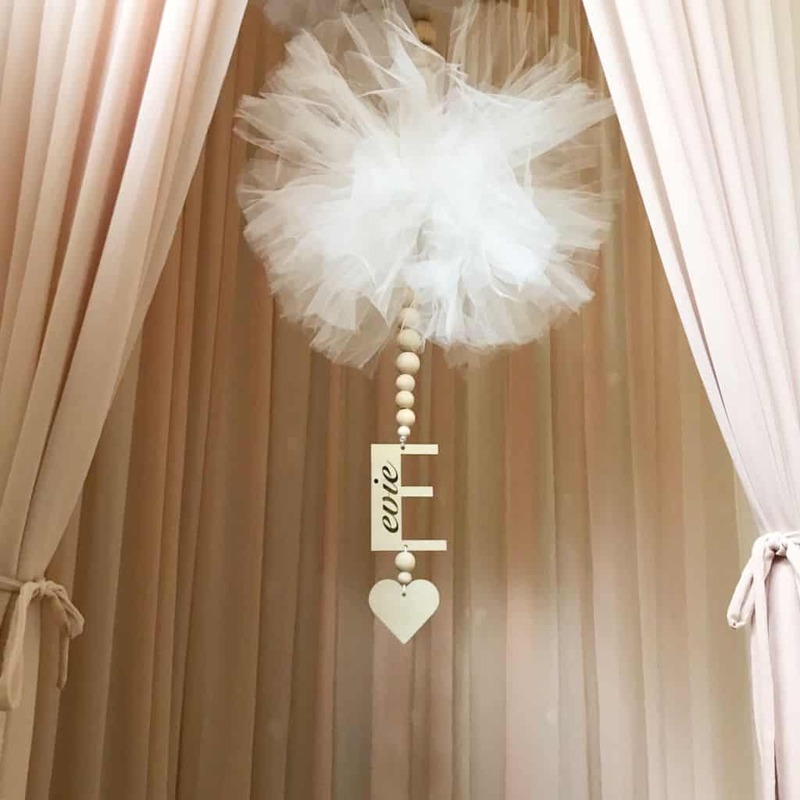 If you’re looking for a unique birthday or baby shower gift, our hand made room decor pieces are perfect for their special occasion. 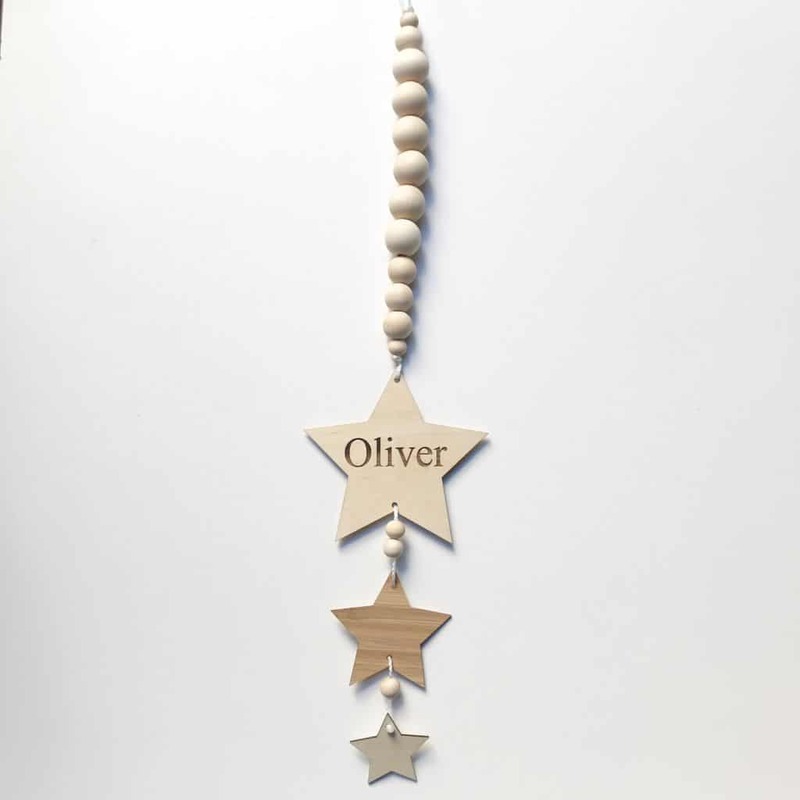 You can choose from the listed designs and colours from the drop down boxes. 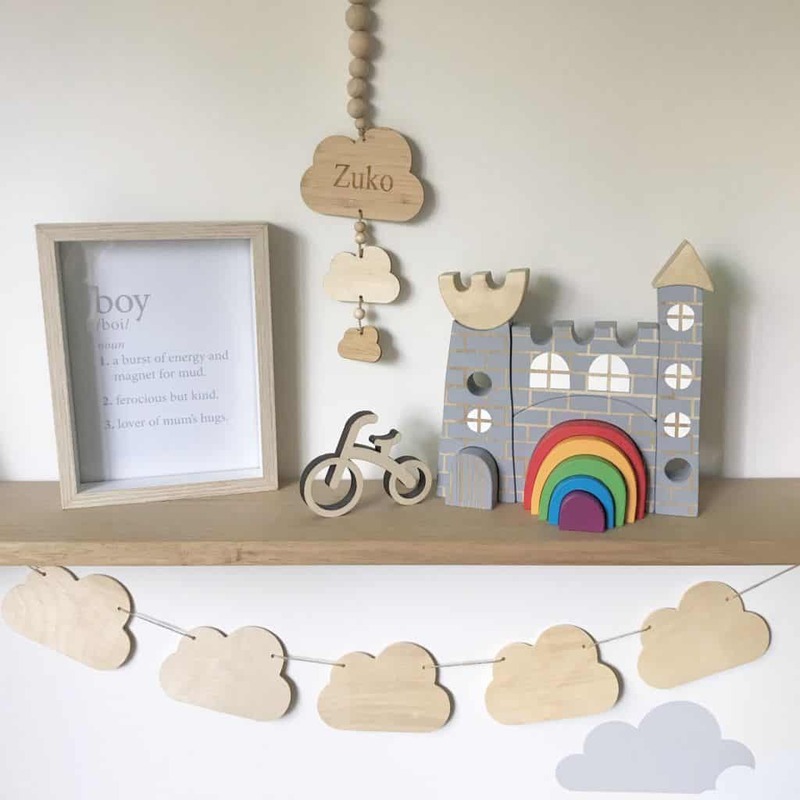 Our alphabet letters and shapes are made from light wood which is a European ply, or dark wood, which is carbonised bamboo. We have chosen the most beautiful and sustainable wood in the range. 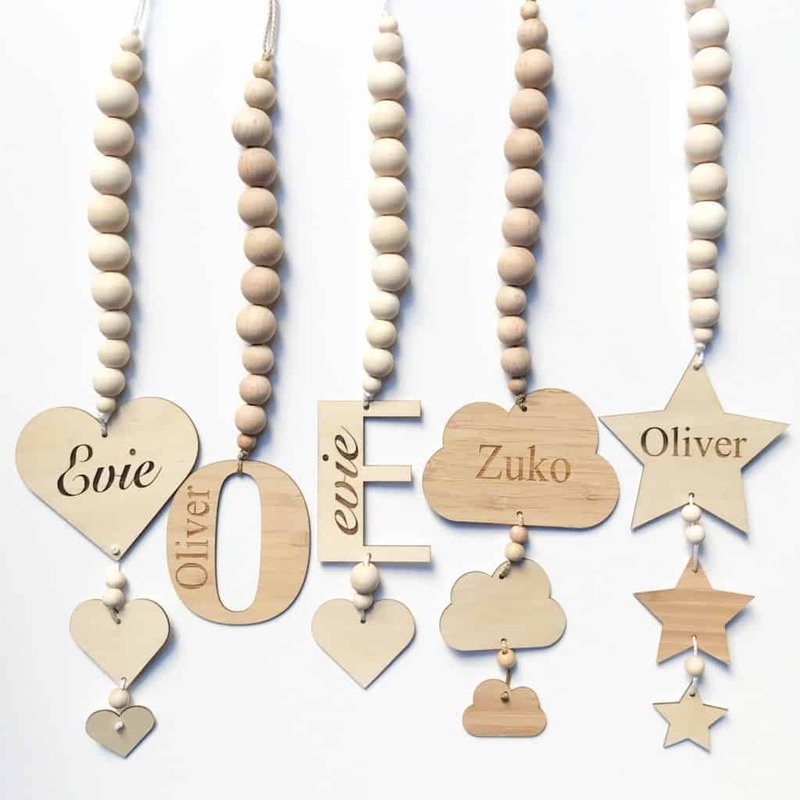 The beads are made from maple wood and beach wood and will compliment the letter or shape you choose. 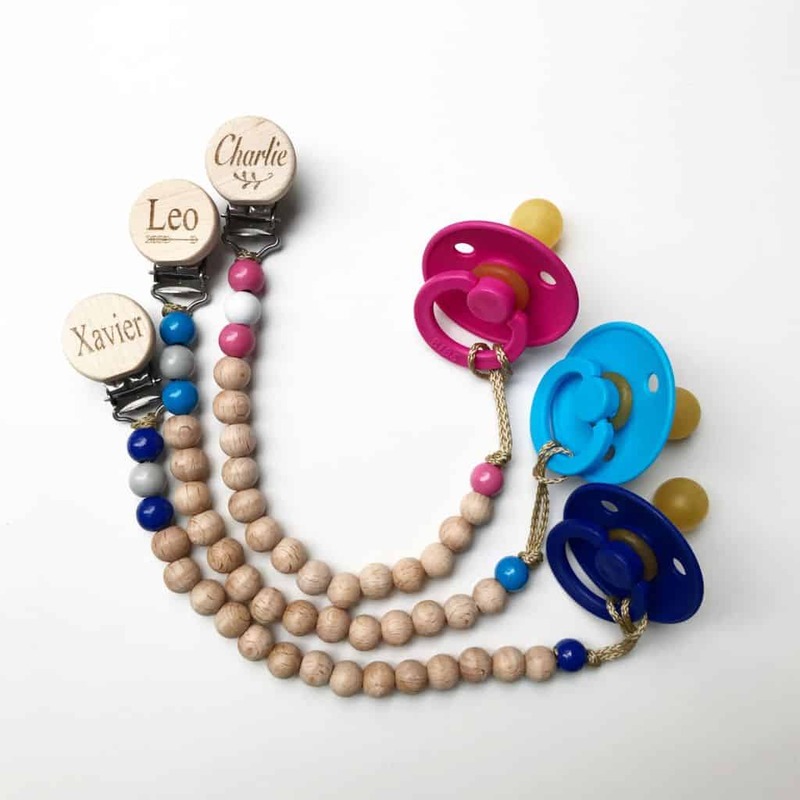 You can add your baby’s name to be etched into the letter of the alphabet or shape, or you can leave it plain. 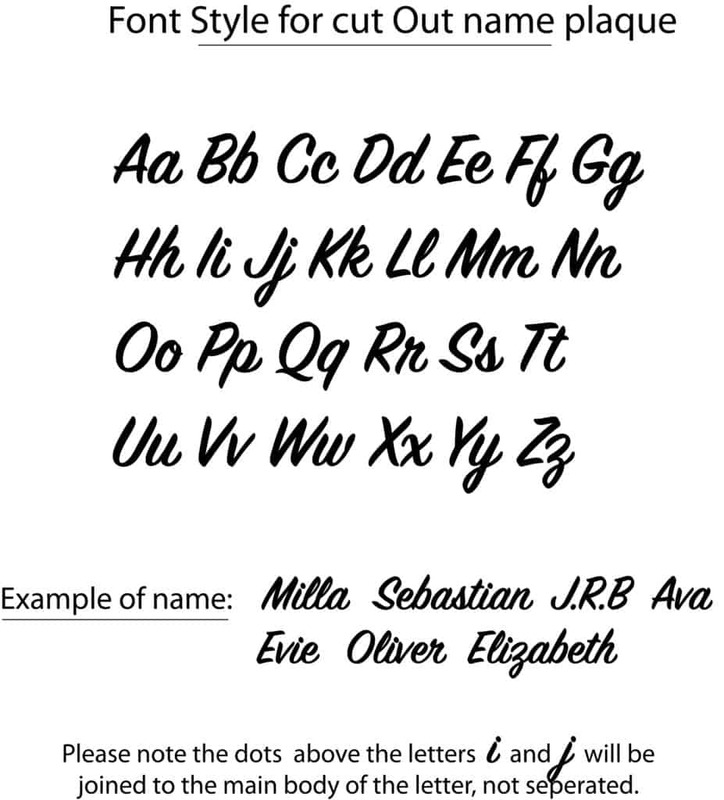 If you’d like to personalise it, please let us know the style of font you’d like; either ‘script’ or ‘classic’ style font. You can see these different styles in the images provided. 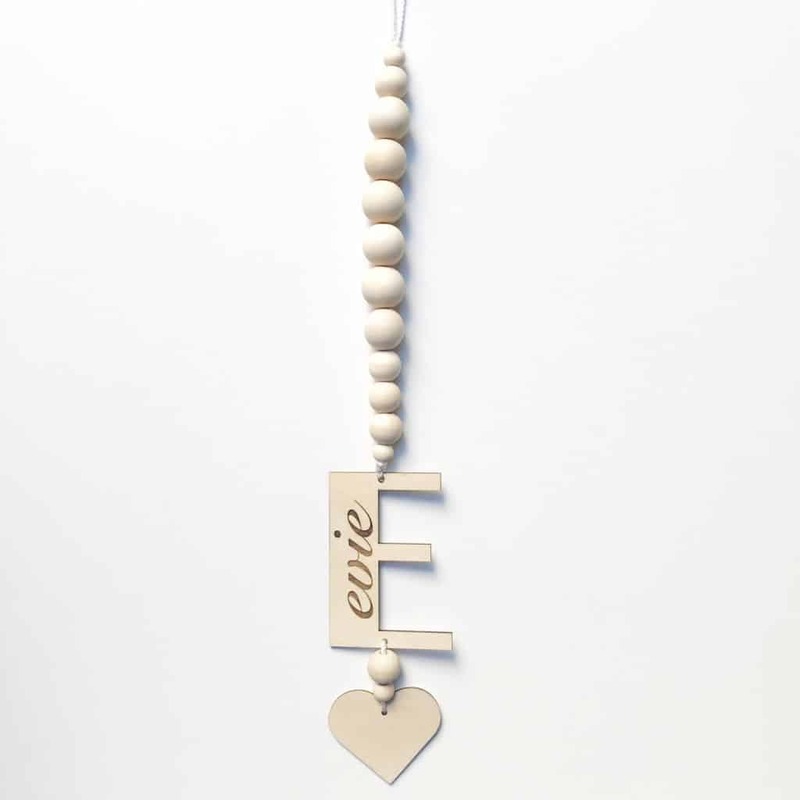 When you place your order, let us know the name and font style to be added to your room decor piece. 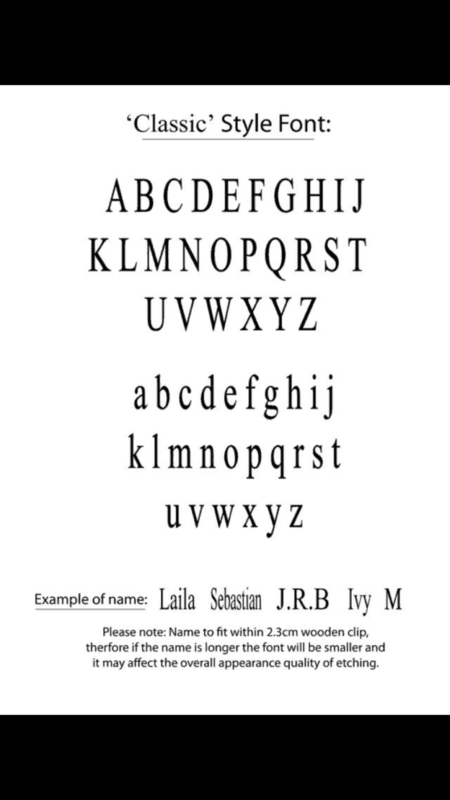 All of our letters are in uppercase only. 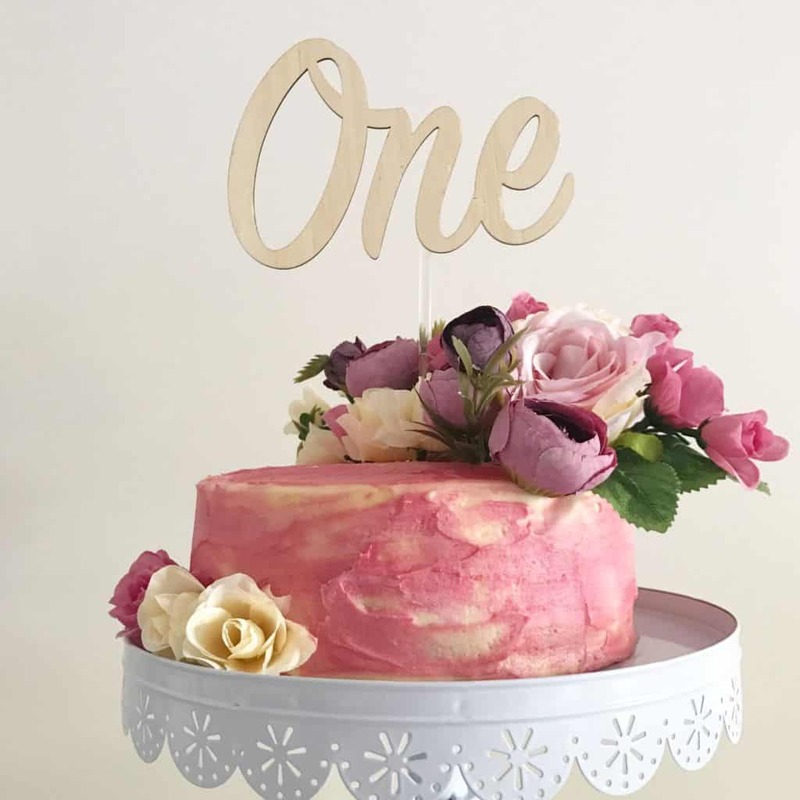 If your hoping for something different from our options provided, send us an email and we can work with you to create your own masterpiece. The single letter or shape drops are approximately 35cm from end to end. 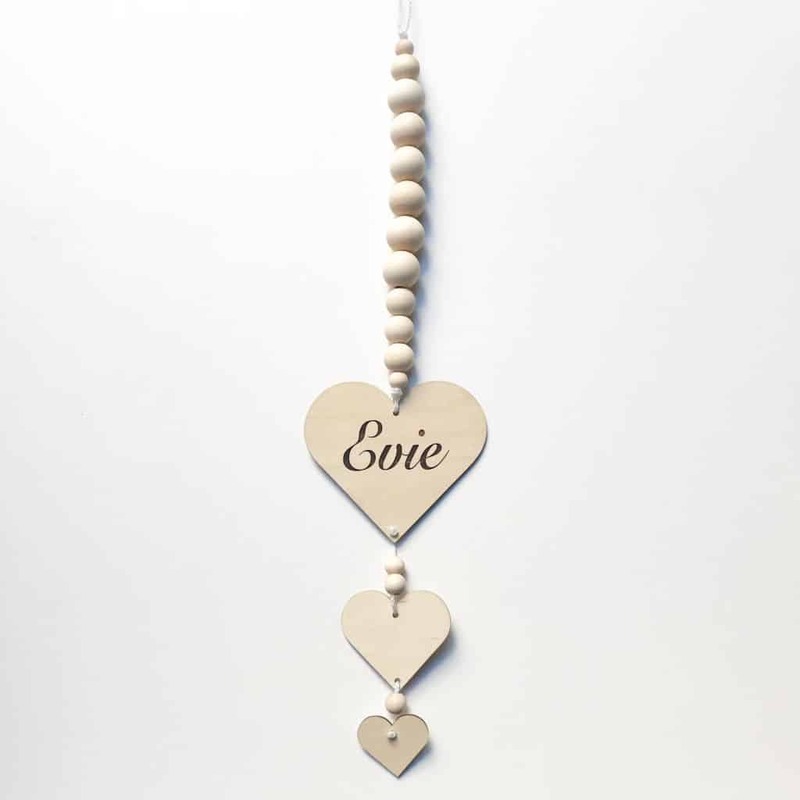 Multiple shape and letter drops are approximately 40- 45cm from end to end. 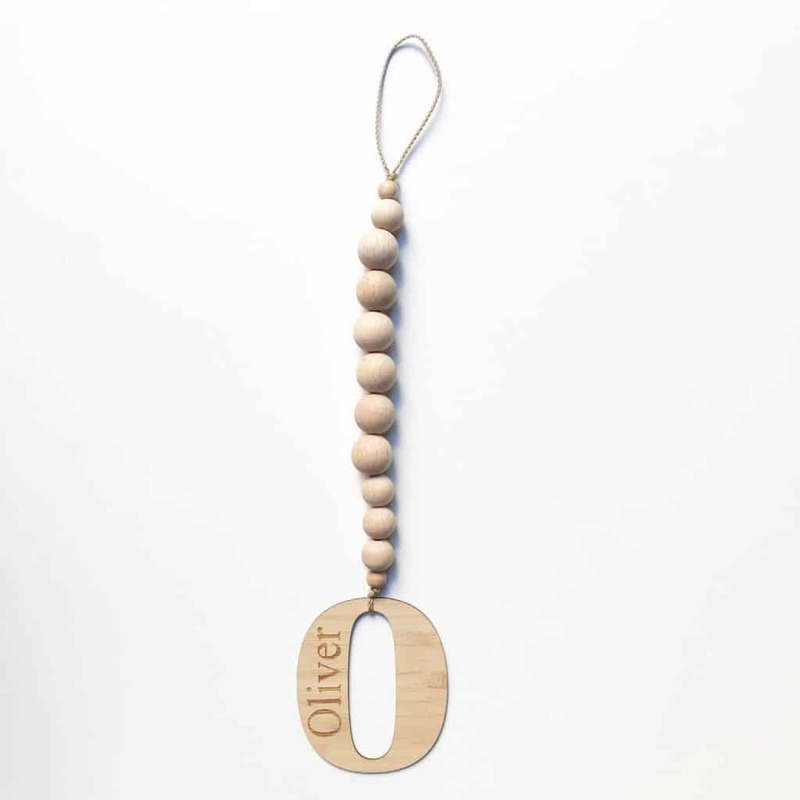 Each wooden letter is 8.5 cm high and each letter width varies; for examaple: the letter M is approximately 8cm wide and the letter I is approximately 2cm wide. The heart, cloud and star shapes vary in size, with the largest being approximately 10x7cm, the smallest is approximately 3x3cm. 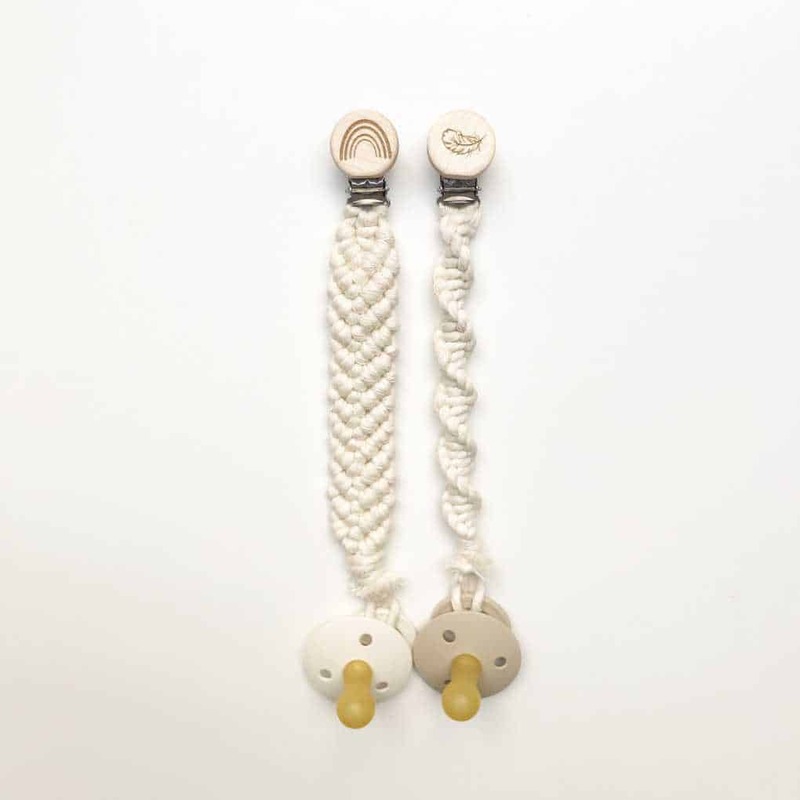 The satin cord loop is approximately 5-10cm long, allowing for it to be hung on a hook or something similar. 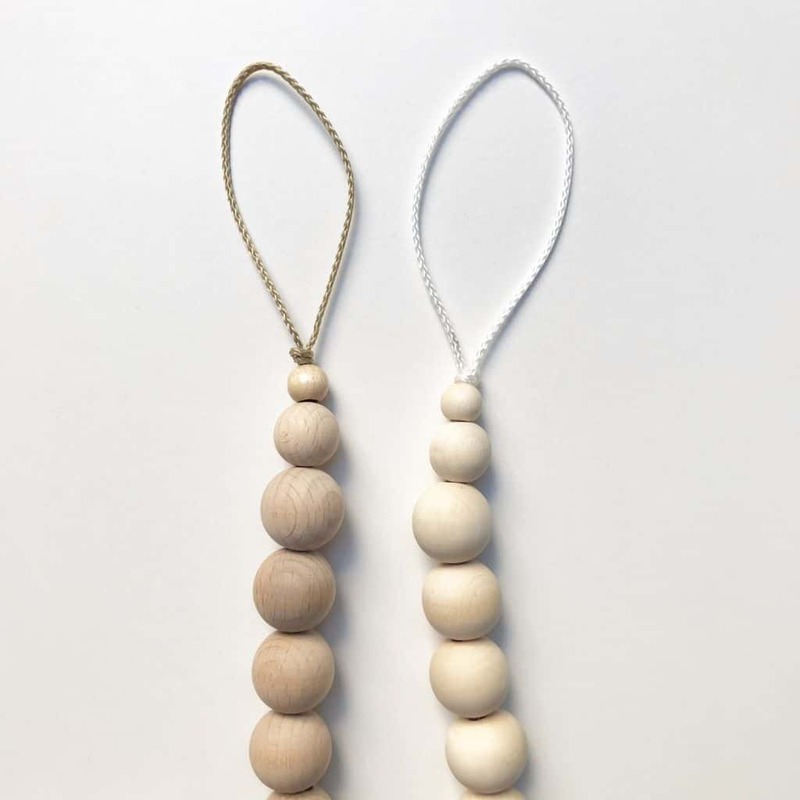 The wooden beads are left in their raw and natural state and vary is size, using a combination of 1cm, 1.6cm and 2cm sizes. 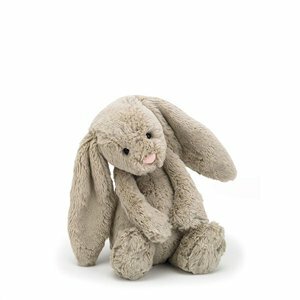 Remember, for safety reasons, this room decor is not to be used as a toy. It is to be handled with care and to be used as a decoration only. 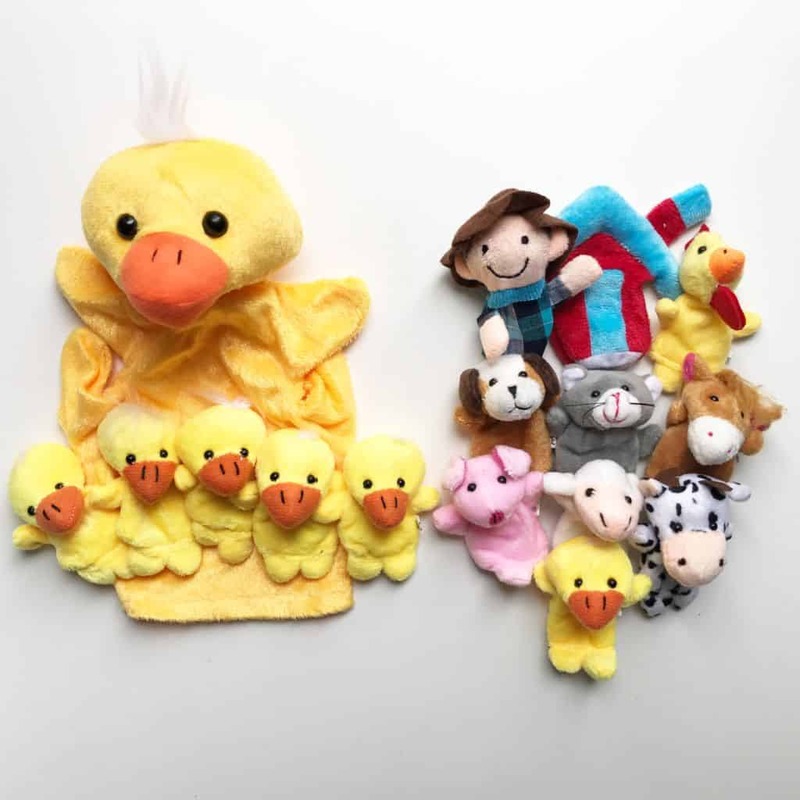 It contains pieces that can be easily broken and can be dangerous for babies and small children. 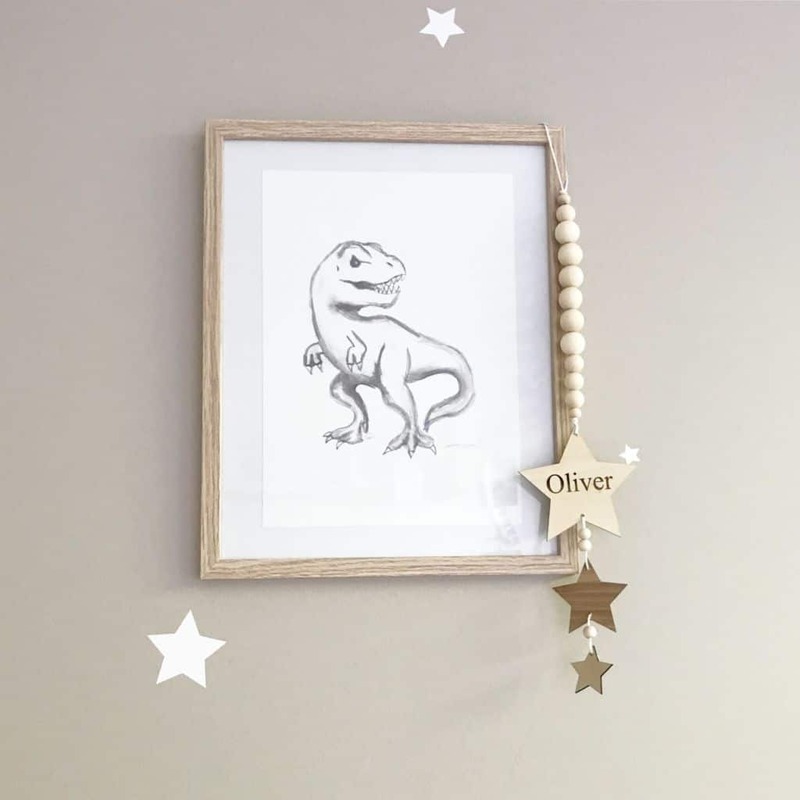 If you’re hanging it in your childs’ room, please ensure it is always out of their reach. 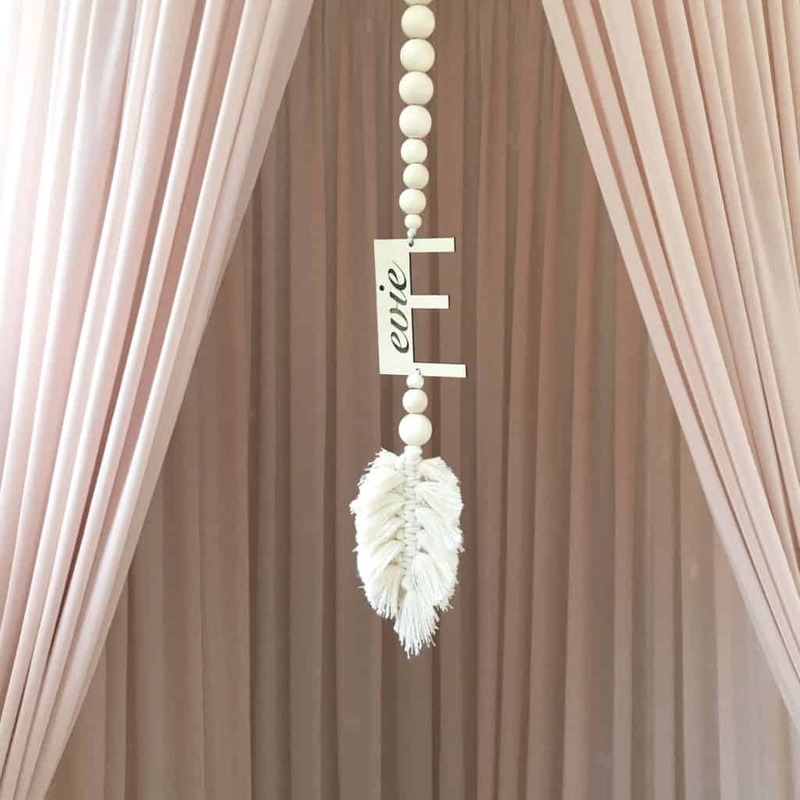 Our room decor pieces are custom made.